In a medium bowl, mix yeast, 1 tablespoon sugar, milk, and 1 cup flour. Set aside in a warm place to rise until light and foamy, about 15 minutes. Using the paddle attachment in a stand mixer or large bowl, beat 4 eggs with 1 cup confectioners' sugar until light colored and slightly thickened, about 10 minutes. Add flour and sponge, and continue to beat the dough until well incorporated. The dough will be too loose for a dough hook, so continue to use the paddle. Gradually add melted butter and continue to beat until the dough is smooth and starts to blister, about 10 minutes. Scrape down dough from sides of bowl, cover and let rise in the same bowl until doubled. Grease two 12x3-inch round pans. Stir down dough and pour half into each pan. Cover and let rise until dough comes to within 1 inch of the top of the pan. Meanwhile, make the crumb topping by mixing 1 stick butter, 6 tablespoons sugar, 2 tablespoons vanilla sugar and 1 cup flour as for pie crust. Set aside. Make the filling by beating farmer's cheese or ricotta, 4 eggs, 2 cups sugar, and 1 tablespoon vanilla sugar. Stir in drained raisins. Set aside. Place rack in the middle of the oven and heat to 325F. When the dough has risen, pour half of the cheese filling on top of each pan of dough and allow to sink in, pushing it down, if necessary. Sprinkle each cake with half of the crumb topping. Bake about 50 minutes or until dough is golden brown and toothpick tests clean. There may be some moist cheese crumbs clinging to the toothpick so test away from the center. Allow the kołacz to cool completely before cutting into wedges. The cheese filling and crumb topping will have sunk down to the middle or bottom of the cake, which is normal. 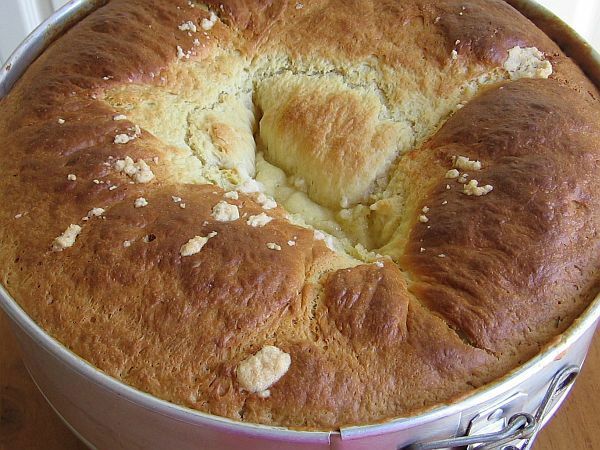 Kołacz can be dusted with confectioners' sugar if desired.